The Maxpedition NeatFreak is as organized as its name suggests. It contains 13 separate internal pockets, allowing you to store your equipment in a logical, accessible way. 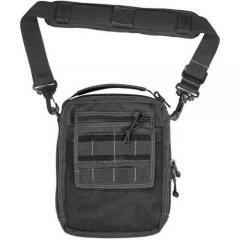 The adjustable Velcro divider includes three additional pockets, and can also be used to attach hook-and-loop accessories including concealed carry holsters. The exterior includes a rear slip pocket for small items and two rows of PALS webbing on the lid, providing additional storage and accessory mounting space. The bag comes with a tri-directional carry handle and a padded shoulder strap for stand-alone portability, as well as a set of Velcro flaps that can attach to other equipment.